Many of our experiments here at Backyard Brains will have you collecting data. 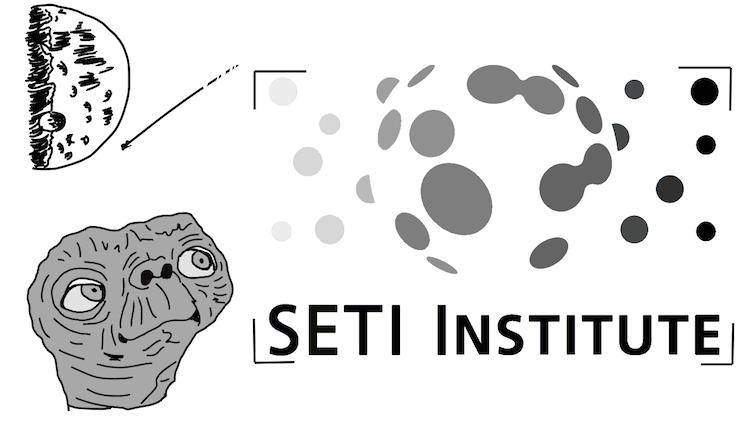 You may be wondering, "well what can I do with all of this data?" Welcome to the wonderful world of Statistics. In this lesson we show you how to formulate a hypothesis and what to do with the data after you have collected it. You can follow along and collect new data during this experiment, use data you have already collected, or follow along with the data we use. The choice is yours. You will learn how to formulate a hypothesis. After you have some data you will learn how to analyze it using fundamental statistical procedures and tests. You will then see if your results support your null or alternative hypothesis. You should have data ready from previous experiments. If not, go back to one of the experiments listed below and collect some data, or follow along using our data set for left and right hand reaction times. In the past three cognitive experiments, you have recorded data and run experiments. The purpose of collecting data is not just for observation, but also for inference (meaning, to draw a conclusion and learn about the population you are studying). Observations are easy. Some people have blue eyes and others have green. 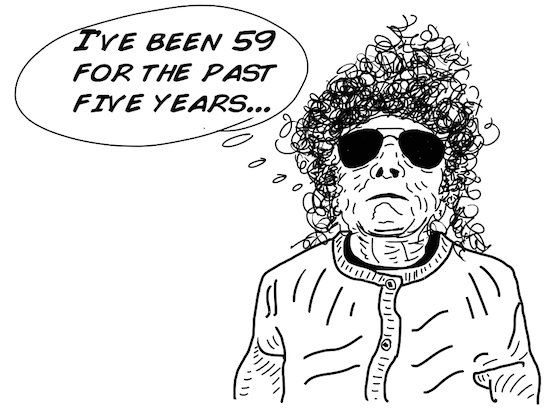 Drawing inferences about a population though can be very difficult. It requires thoughtful data collection and elegant analysis. For example, how do you determine the average height of a man? You wouldn't solely go to an NBA basketball team nor a Kentucky Derby Horse Jockey convention would you? Going further and using inferences to show how two populations are different can be even more challenging. Is it possible to prove that on average men are taller than women? Many variables could throw you off from making a valid conclusion. 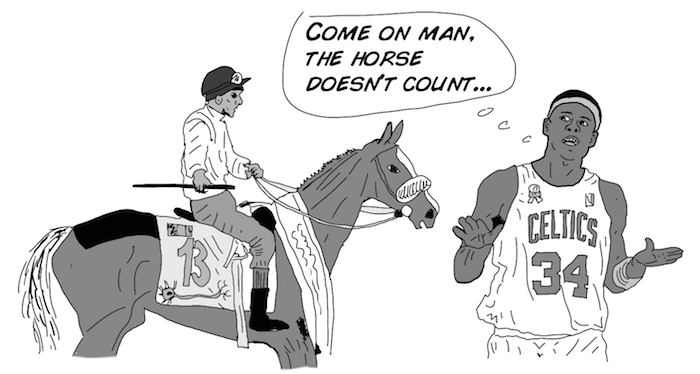 Collecting average female height data solely from the WNBA and male height solely from the Kentucky Derby jockeys would result in a population bias as well as a small sample size. Finally, was data self-reported, or was it professionally measured? As you can imagine, collecting good data and analyzing it is hard work. The good news is that becoming a statistician is a lucrative profession. Governments, Wall Street, corporations, labs, and even some individuals all need good statisticians, and they are usually willing to pay good wages. In this lesson we will do some basic statistical analysis. Before we do this though, you must go out and collect data. Luckily, if you have already completed one or all of the last three cognitive experiments, you will have some data to work with. We hope you did best to control your methods and be consistent! You are welcome to follow along with your own data sets, or collect new ones. If you have a small sample size though (less than 7 subjects for any of the past 3 experiments), you should collect more data. Before we begin to collect data, we are going to form some hypotheses. Our first hypothesis will be: right-handed people have a faster reaction time with their right hand than their left hand. 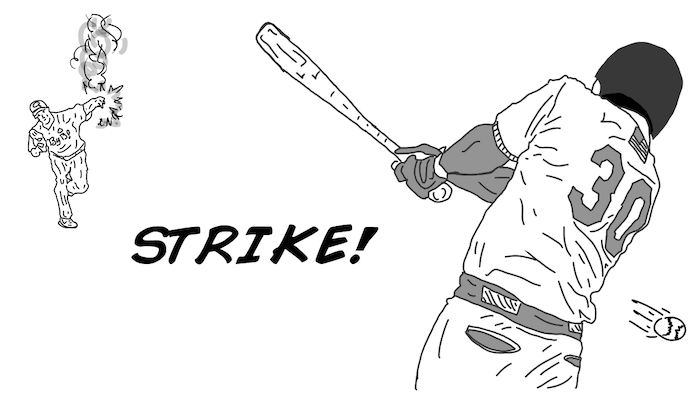 Our second hypothesis will be: left-handed people, since they are special, are faster than right-handed people. Below is a data set we collected from performing Cognitive Experiment #3 Reaction Time. Here we show the reaction times for both left and right hands for the visual cue. We gathered 20 college age volunteers, 10 left-handed and 10 right-handed. Reaction time is displayed in seconds. Now that we have the raw data written down, we can begin to look over the results. There appear to be no "strange" values, so our data set is probably good. For example, if one of our values were a .78, we would probably throw this value out and not use it. Sound fishy? Sure does, but there is math to it, which can read more about outliers here. 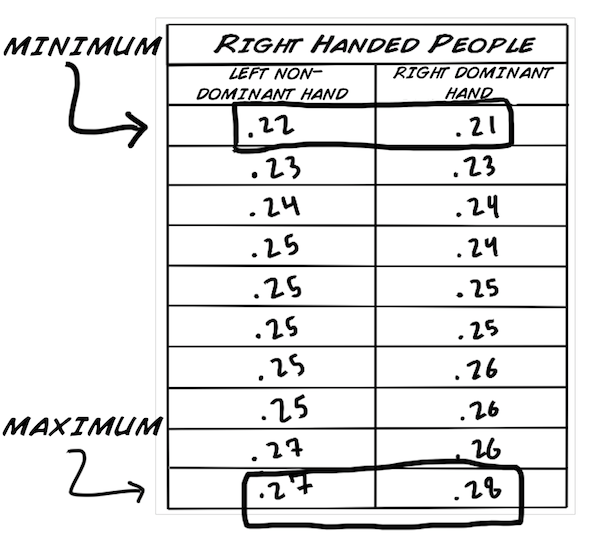 Hypothesis 1: Right handed people are faster with their right, dominant, hand. 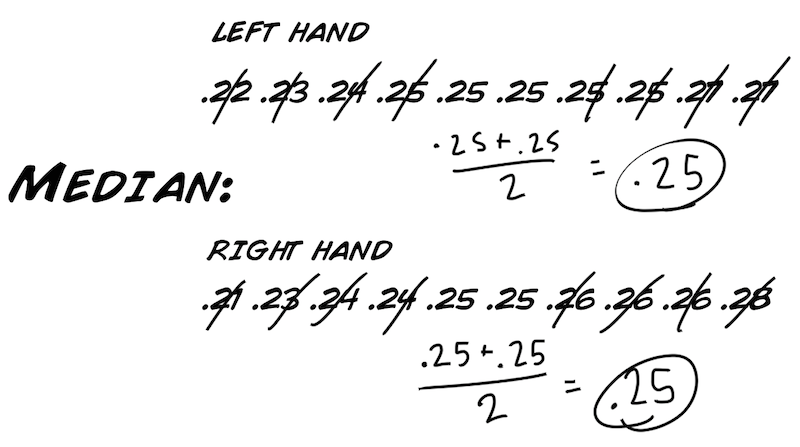 Hypothesis 2: Left-handed people are faster than right-handed people are. We formatted the values in ascending order as well, because it makes the data easier to work with and look at. Before we go into statistical tests, we should calculate some basic values. The minimum is the lowest value. The maximum is the highest value. The mode is the value occurring most frequently. The median is the middle value in an ordered data set. If we have an odd number of data values than the median is the middle number. For example, in (1,2,3) the median would be 2. If we have an even amount of data values, there will be two middle values, and the median will the mean of the middle two. For example, in (1, 2, 3, 4) the two middle numbers are 2 and 3. Thus the median would be (2 + 3)/2 = 2.5. First we want to find these values for the data in our first hypothesis. If you look at the means, there is not much of a difference. We can infer that a majority of the data in both sets centers on: .247 and .248. The minimum and maximum values for both sets are fairly the same as well. This means that right handers' fastest and slowest reaction time was nearly the same. The standard deviation is slightly different for both sets. 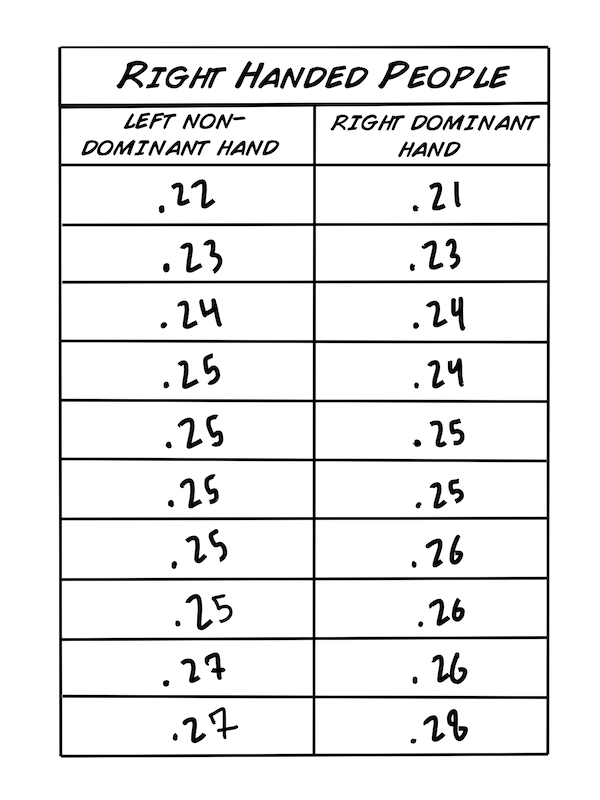 The standard deviation for the right, dominant, hand is a little bit larger (.193 seconds) vs the left hand (0.0155 seconds). 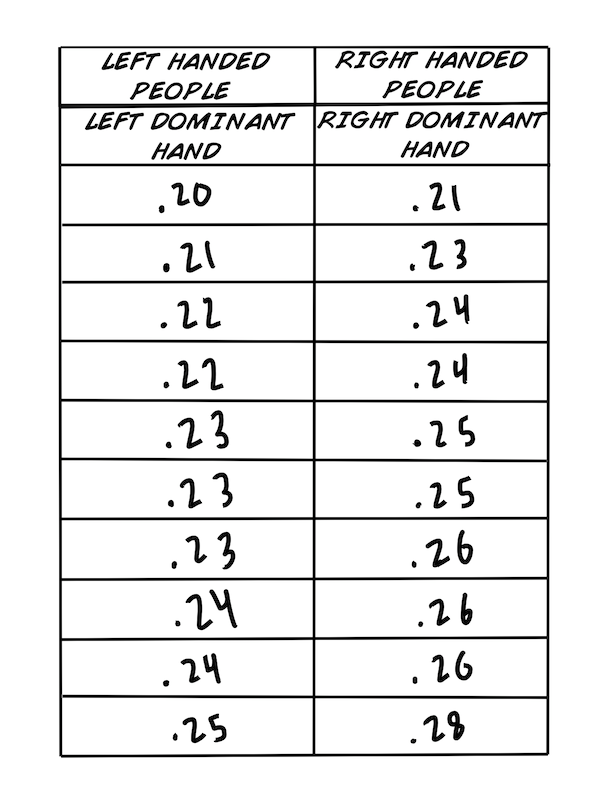 This shows that the data spreads slightly further from the mean for the right, dominant hand than for the left hand. Or, the right hand is more "variable." We solved these values for the first hypothesis data set, and you can calculate for the second data set. Now, if we want to make any sort of inference on the population of right handed and left handed people and their reaction times, we must graph our data and run statistical tests. We will now learn about probability distributions before diving into statistical testing. First, the data is graphed in the form of a "histogram". Density or (number of occurrences) is the y-axis. The x-axis is the range of values recorded from the experiment. The curve along the graph is the "normal distribution curve", which is a type of probability distribution. What is a probability distribution? It is an equation or a table of values that connects the recorded outcomes (in our case, reaction time) with its probability of occurrence. 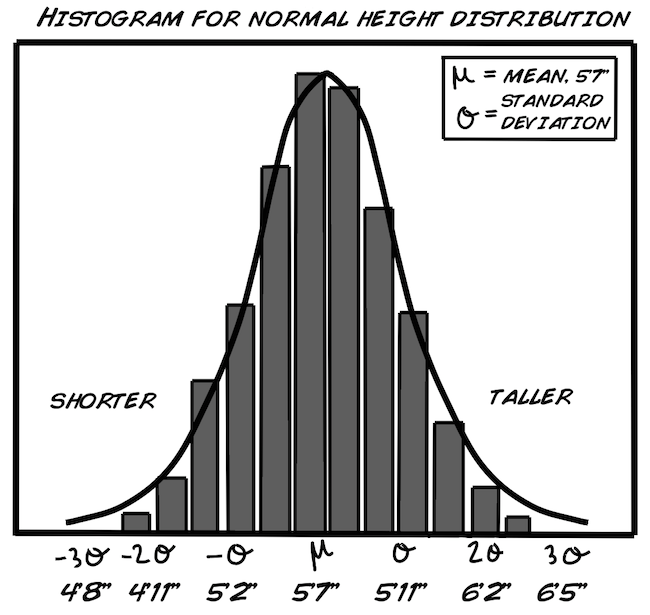 Here are the histograms for right-handed people. You can make you own histograms for left-handed people using Excel or any other type of graphing program. Ask your teacher or neighborhood scientist for help if you do not know how to do this. Approximately 95% of people fall within two standard deviations from the mean (between 4'11 and 6'2 tall'). Approximately 99.7% of people fall within three standard deviations mean (between 4'8 and 6'5 tall'). You might be thinking, "Our graphs do not look normally distributed at all!" This is partially true, because we have such a small sample size. If we took many more samples (perhaps 100), we expect we would eventually see a normal distribution curve in our reaction time data like the one above for human height. 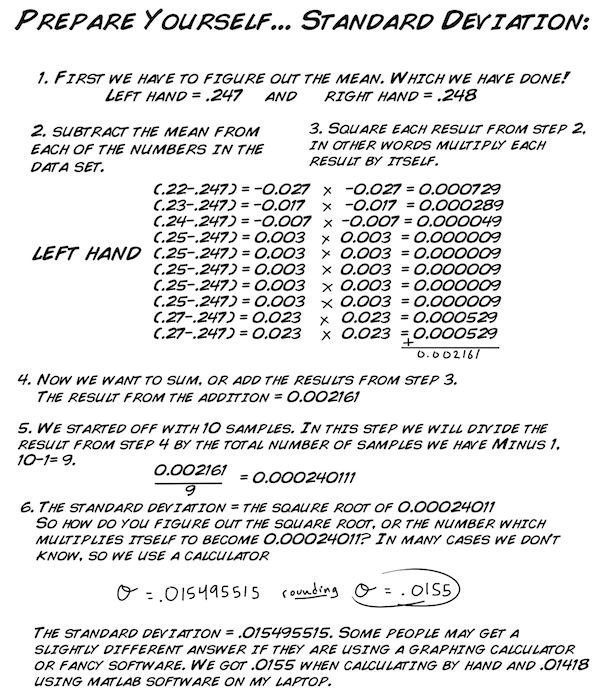 Now how do we test if the two data groups (right handed subject's left hands vs. their right hands) are different? We will be performing a T-test, or "Student's T-test." The famous Dr. Student was a real statistician, but "Student" was not his real name. The test's name is due to the unusual circumstances from where it originated. William Gosset, a chemist working in Ireland for the Guinness Beer Company, conceived the test in 1908 as a means of quality control for the brewery's ingredients. He wanted to publish his statistical test in a science journal, but Guinness would not allow him to use his real name as they considered the analysis a trade secret. Nevertheless, they did allow him to publish under a pen name. What Guinness did not know was that the scientific community knew Gosset's pen name, Student, anyway! Now we have better beer and better statistics. The T-test is powerful, because it allows us to make inferences from a small sample size about the whole population. We will show you how to do a T-test for the first hypothesis, but it will be up to you to perform the T-test for the second hypothesis. Before we can begin to crunch some numbers, we must clearly define our null and alternative hypothesis. You may be asking why we need two hypotheses for a statistical test. In formal statistics, we always compare two hypotheses, the null and alternative. 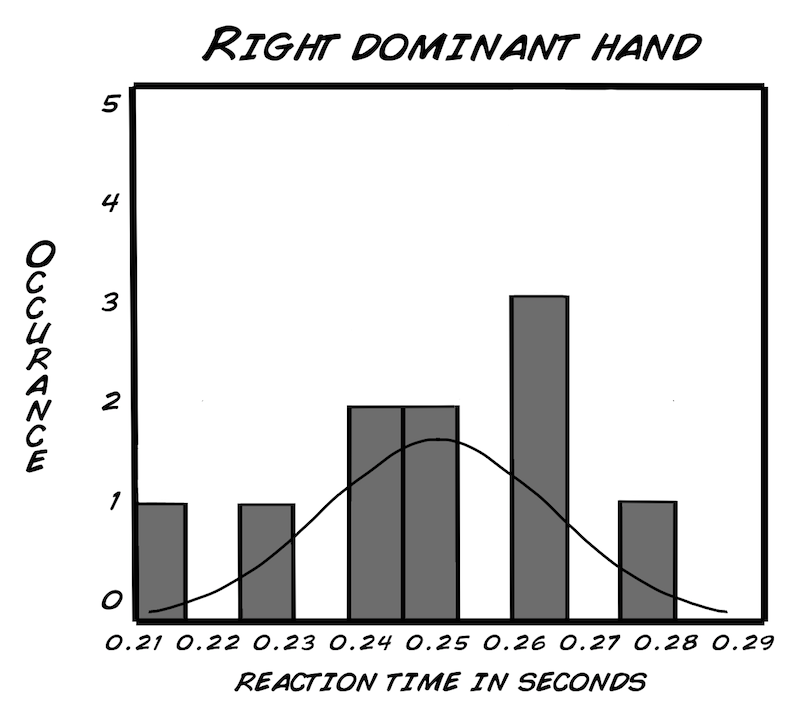 The null hypotheses: There is no difference in reaction times between left and right hands. 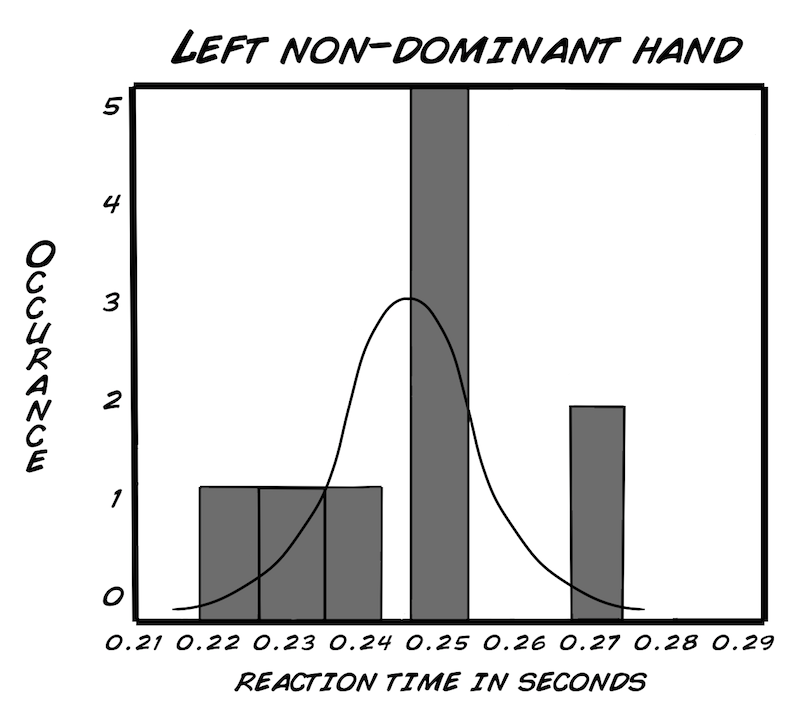 The alternative hypothesis: Rights hands have a faster mean reaction time than left hands. 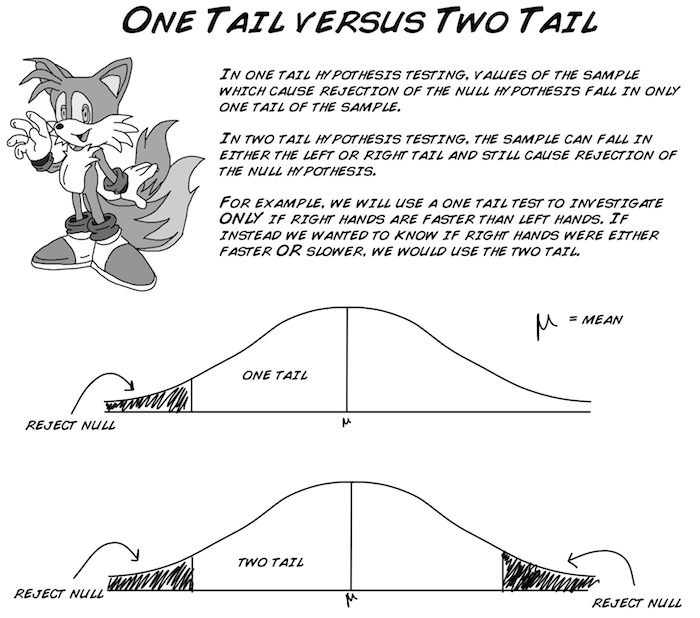 Now, we need to decide if we want to complete a one or two-tailed t-test. For this test, we will be using the one-tail. This is because we are only concerned with testing if the right hand is faster than the left hand, NOT if it is either "faster" OR "slower". Stated differently, if we did not care which sample was faster, and we just wanted to see if the two samples did not have the same mean, we would use a two-tailed test. Lastly, we need to set the "alpha value" which can be viewed as a "threshold for acceptance." Common values are .05, .01, and .001. With an alpha value of .05, there is a 95% chance your results are correct. With a value of .01, there is a 99% chance your results are correct, and so on. . . You can never have an alpha value of zero, because you can never be 100% confident of anything in statistics (this is not a joke). The alpha value is more commonly called a "p-value". With a t-test, you calculate a "t-statistic", and compare it with a known "t-value" on a look-up table associated with the p-value you set. If your "t-statistic" is greater than the "t-value" you look up, then you can reject the null hypothesis and state that right hands are faster than left hands! Confusing? Don't worry, we will go over this process again below, it's difficult for everyone learning it. Now, let's gather all the data we have on our two samples. If you recall, from the "Raw Data, Graphs & Distributions" section above, we found the following: min, max, mode, mean, standard deviation, and Median. 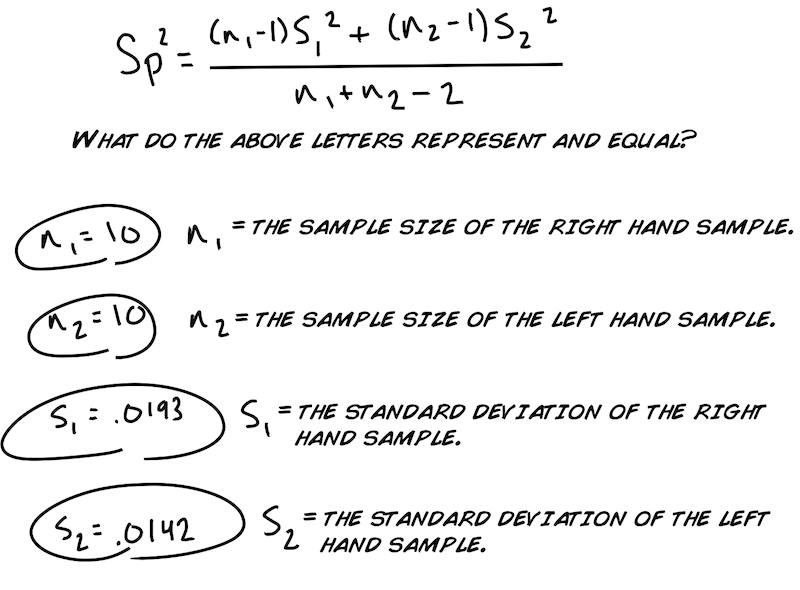 For the t-test, we need the mean, standard deviation, and a couple more numbers, which we will calculate below. Step 1: Find the "pooled variance", or Sp^2. 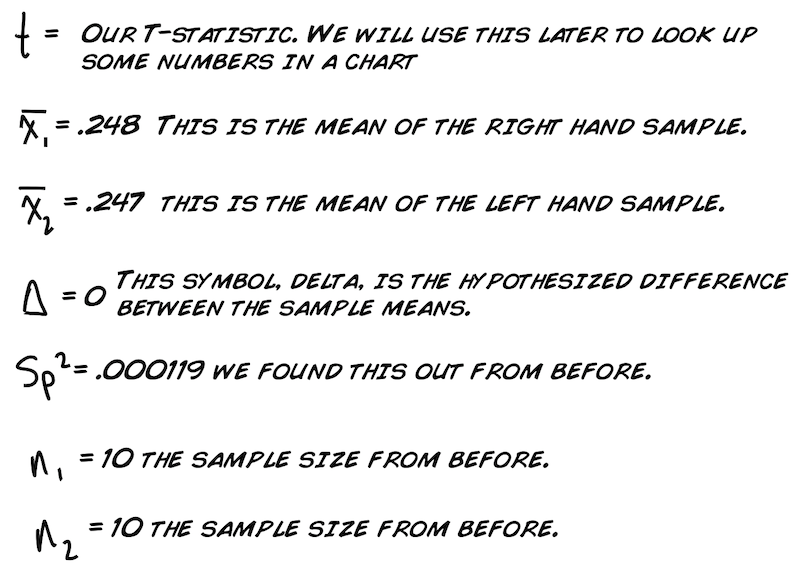 Note how the subscript "1" represents the data for the right-hand sample and the subscript "2" represents the data for the left-hand sample. This annotation will stay consistent during our calculations. Next let's substitute the letters in the equation above with our numerical values. Step 2: Calculate your t-statistic. Again, what do these letters and symbols mean? We know: Sp^2, n1, and n2. But what about the rest? Note, delta, is equal to zero. Why would the hypothesized difference between sample means be zero? HINT: Refer back to the Null hypothesis. We are now ready to substitute! Plug in all the numerical values. 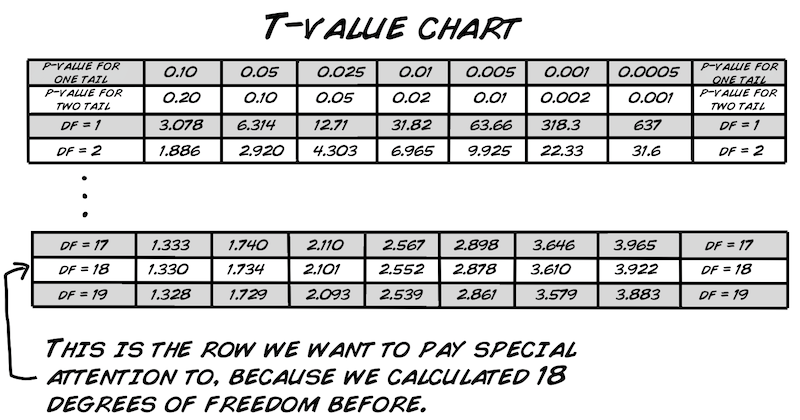 We compare our t-statistic against the standard t-value chart, and you can look it up in the back of a statistics textbook or here: t-value chart. For this we also need our "degrees of freedom", our df, which is the number of independent pieces of information that are FREE to vary. One way to think about it is with sports. Let's say you are the coach and your team consists of 11 players and the game you are playing has 11 positions. You assign the best player to each respective position. How many choices do you have to make? Not 11, but 10 choices. Once you assign player 10, by default your last player fills the eleventh position. 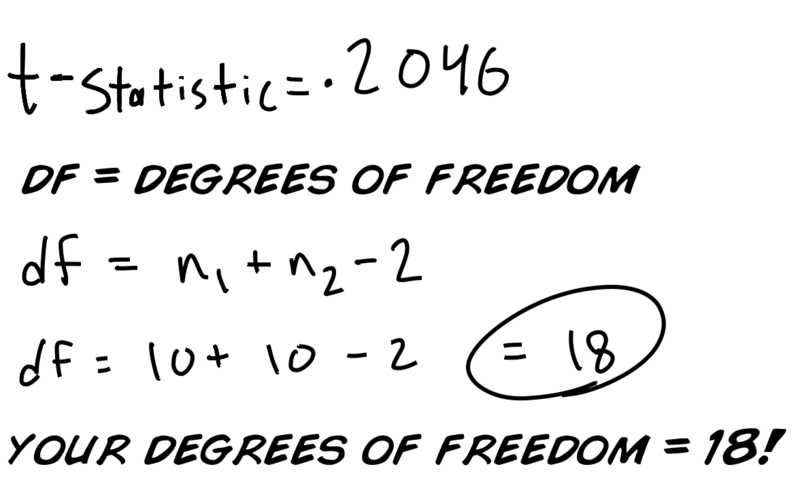 Thus, you had 10 choices, or 10 degrees of freedom. Look up your p-value, which we decided would be 0.05 using a one-tail test. Match this up with the df=18, and you get a t-value of 1.734. As our calculated t-value, 0.2046, is LESS than 1.734, we CANNOT reject the null hypothesis. 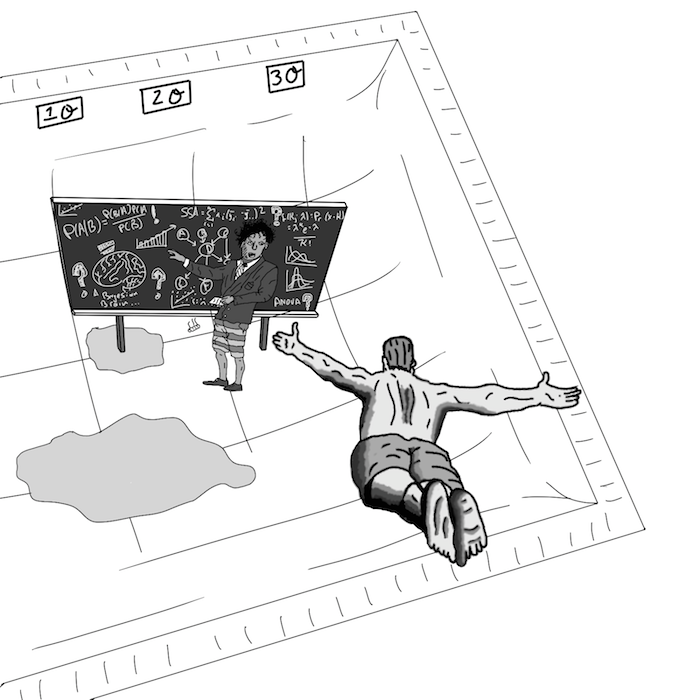 What if we use a less stringent p-value, say 0.10? We cannot state that right hands are faster then left hands in right handed people. Are left-handed people faster with their left hand than right-handed people are with their right hand? Left-handed people are faster than right-handed people are. Cool! Now that we have some results, let's discuss them. This is the part of science that leads to more questions. 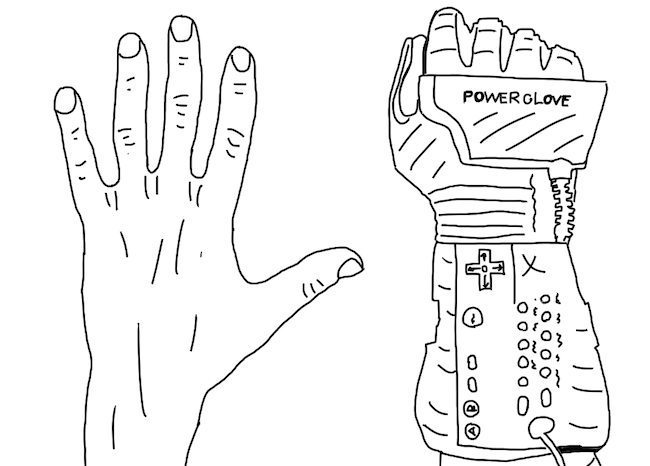 If left-handed people have faster reaction times, perhaps they are smarter too! Maybe we can run some IQ tests! Maybe we can measure the diameter of their nerves somehow, and see if they have faster conduction velocity! Note that the first hypothesis, in which we didn't find any difference between the left and right hand in right-handed people, is more difficult to discuss. Perhaps there is a difference, but we did not have enough sample size to detect it (this is called a type II error, or "false negative"). In science, it is much harder to prove an "absence of something" than a "presence of something". Alternatively, as alien hunters like to say: "absence of evidence does not mean evidence of absence." In our experimental group we used volunteers instead of a random sampling for 10 subjects. How does seeking random subjects differ from asking for volunteers to step forward? Does this bias the data at all? Does this choice in data acquisition strengthen, weaken, or have no affect on our final inference? Do you ever think a study is done? What does the 95% confidence (alpha value =0.05) mean for extracting the "truth"? Do you notice anything strange about the distribution graphs from our collected data? 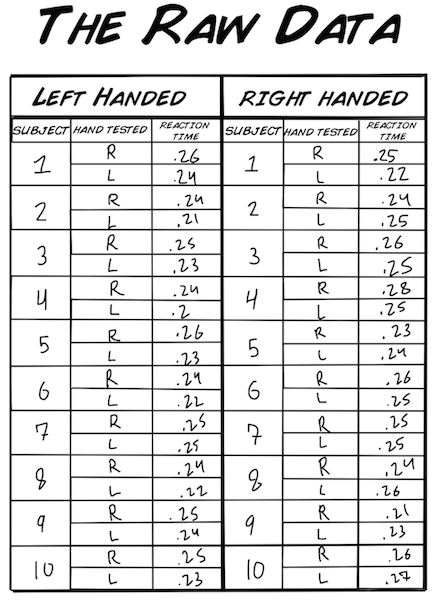 We only compared right-handed people's reaction time with respect to their right and left hand. What would you expect to see with left-handed people regarding their left and right hands? You can do that analysis yourself!